Plan of Machuim. 400dpi copy of GV006371. View of stone circle from SE. View of stone circle from NE. This circle consists of six massive stones standing on the circumference of a circle about 20ft in diameter on a mound about 40ft in diameter. Listed as a six stone graded oval, 6.7m by 5.8m, standing on a mound. (Condition '3': ruined but recognisable). NN 6820 4015. 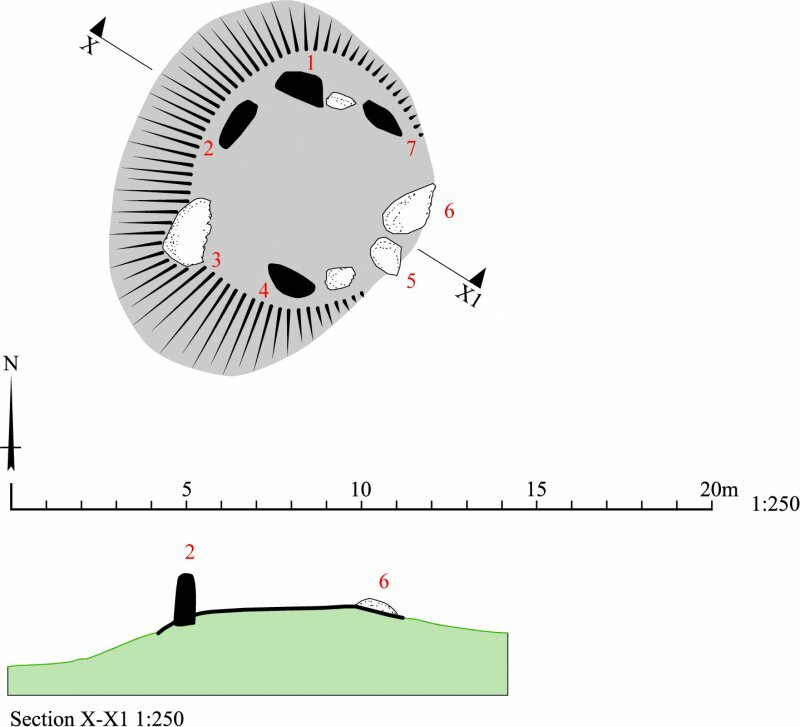 The remains of a stone circle, dimensions as stated by Burl, comprising four upright, slightly graded slabs, and two partially buried slabs (D and F on plan) that were probably once standing. The largest stone (A) measures 1.5m high, 1.4m wide and 0.5m thick. 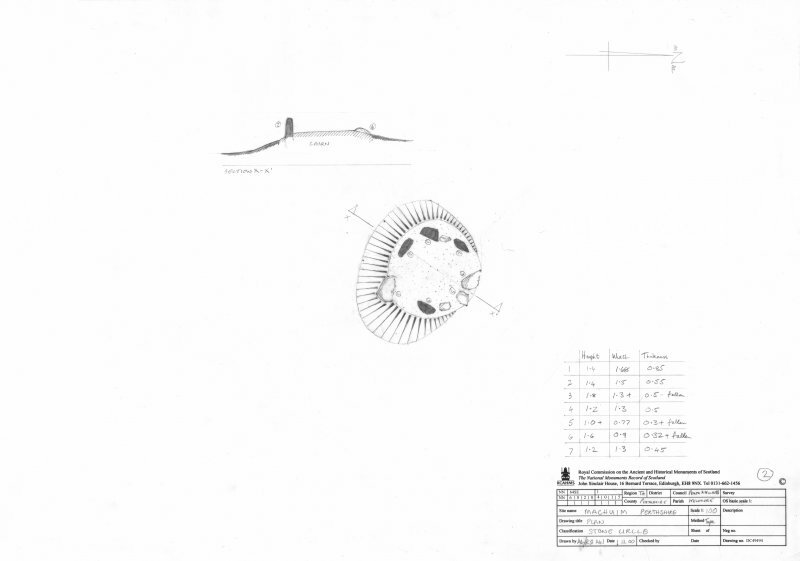 The stones are placed within a turf-covered, sub-circular mound approximately 10.0m in diameter and 1.0m high. Set in the mound between stones A, B and C and on the S side of stone E are three small boulders. The constructional sequence of stones and mound is not clear, but although somewhat accentuated by field clearance, the mound does appear to be a contemporary feature. This stone circle stands on a low rise in improved pasture. It appears to have been constructed on top of an earlier cairn, which measures 7.3m from E to W by 7m transversely and 0.65m in height, and whose surface is partly obscured by dumps of recent field-cleared stones. 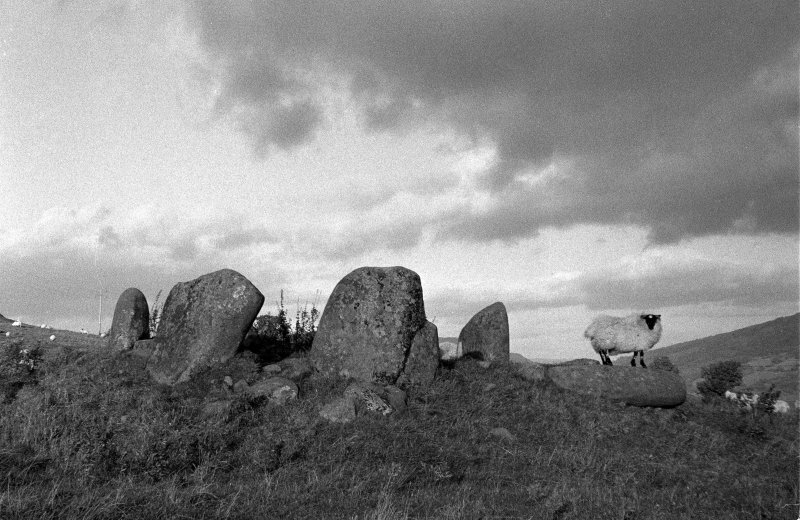 The circle measures 6.2m from NE to SW by 5.8m overall, and probably comprised seven large erratic boulders set on edge around the cairn's flat top. 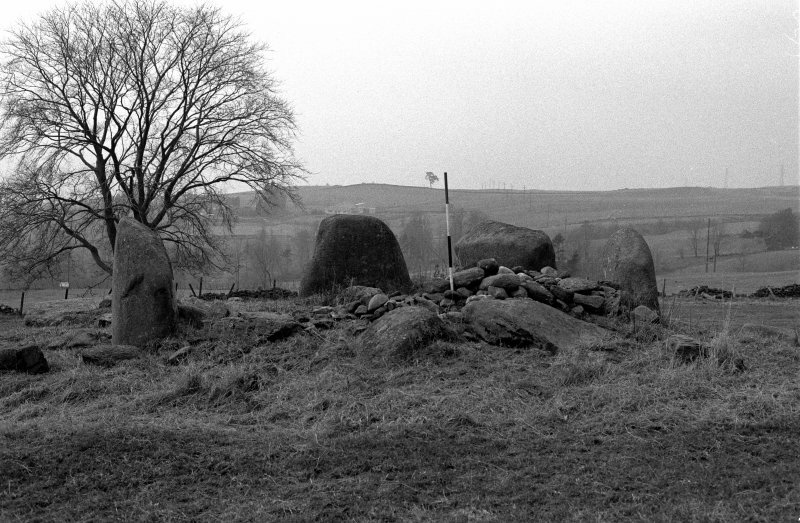 Four stones remain standing and three have fallen; two additional stones, much smaller than the others though also earthfast, and which lie between the orthostats in the NW and NE arcs, may be no more than field clearance. The stones appear to be graded in height, from 1.4m in the SW arc to 1m on the NE, and all present their broader and more regular faces outwards. One stone is noteworthy for having a broad band of quartz, and two stones are decorated with cupmarks. One of the cup marked stones, in the NW arc, has two shallow cups on its external face, each measuring 30mm in diameter, and another on its internal face, measuring 50mm in diameter; the other, in the SW arc, has one faint cup, measuring 45mm in diameter, and two possible cups, all on its internal face. The stone circle is depicted upon John Farquharson's 1769 Survey of the North Side of Loch Tay (National Archives of Scotland RHP 973/1, Plan 14) as a 'Druid temple'. At that time it already stood within enclosed and cultivated ground. Coles and Burl both name this site Machuinn, while Feachem names it Machulm. Both versions appear to be errors, as the farm on which the site stands is spelt Machuim on the first edition of the OS 6-inch map (Perthshire 1867, sheet LVIII), and on all subsequent editions, while John Farquharson's 1769 survey gives the form Mahuaim.